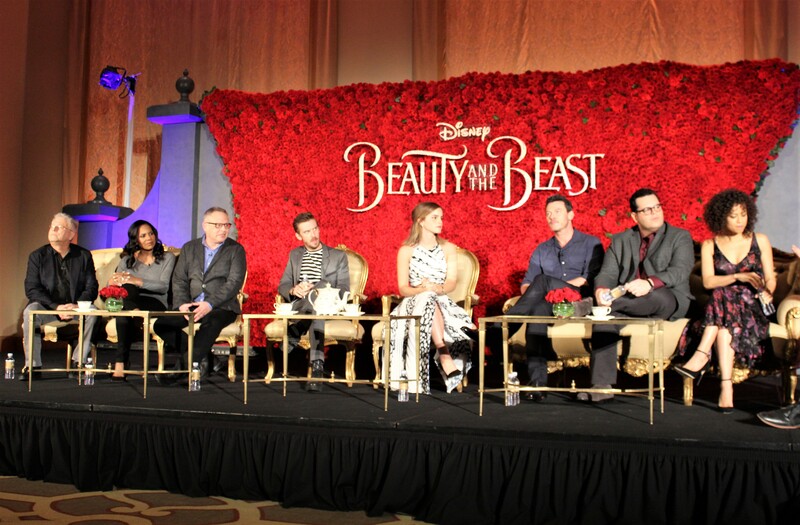 Recently, I was able to attend the press conference for Disney’s new live action Beauty and the Beast, and get an inside scoop about the process of creating the film! I’m excited to share with you what I learned from the film’s actors, director, and music composer. Bill Condon, the film’s director, had the huge task of taking an animated movie with a HUGE fanbase, into a live action version of this classic story. Condon explained that the first step in adapting Beauty and the Beast was to answer some of the questions about the characters and storyline that weren’t answered in the animated version. Animated films need to be a bit more exaggerated, but a live action movie calls for some more investigation into the lives of Belle, the Beast, etc. This is one of the major aspects that makes this film different. Alan Menken, who created the music for the Disney animated film as well as the 2017 Beauty and the Beast, added that the decision to include a backstory for how Maurice and Belle ended up in their village, as well as a backstory for the Beast’s personality, helped them in figuring out how to tell this version of the story. Dan Stevens (Beast) talked about how the role of the Beast was unlike any other he has played before, having to take on new physical challenges. His time filming as the Beast included a muscle suit and stilts, all the while doing this along with choreography! Gugu Mbatha-Raw (Plumette, aka the Feather Duster) loved that she was getting to be a part of the 2017 Beauty and the Beast, since she was “so obsessed with the original Disney film.” Mbatha-Raw’s process for portraying Plumette included working with a French dialog coach, embracing her inner child. Mbatha-Raw felt that getting to voice a character was quite freeing, with those role not being solely limited to her face and body, but that she could just play the character through her voice. Luke Evans (Gaston) wanted to dig deep into Gaston’s back story, and really figure out how he became a villain. Evans enjoyed getting to play a character who gets to be both the bad guy, but also a hero to the villagers. He worked towards having Gaston’s rise into villainy progress throughout the movie. Beauty and the Beast is no doubt one of the most classic stories ever told, and part of the reason it is is because it has so much meaning to millions of people. The cast of the 2017 Beauty and the Beast came on to this project with their own reasons why Beauty and the Beast is special to them. Audra McDonald, who plays Garderobe in the film, explained how being a part of this story was important for her. It was important for her to be able to help tell this story since Belle is such an important role model to girls her daughter’s age. Josh Gad (Le Fou) remembers seeing Beauty and the Beast in theaters at a young age, and recalls how everyone in the theater applauded for the movie. When he became a part of the 2017 Beauty and the Beast, and getting to show this movie now to his own children, made him feel choked up. Emma Watson (Belle) agreed that Belle is a character with positive influence, with Watson herself having looked up to the character when she was a child. Belle was a character that Watson deeply resonated with. Beauty and the Beast comes to theaters nationwide on March 17th. You can visit the official site here.